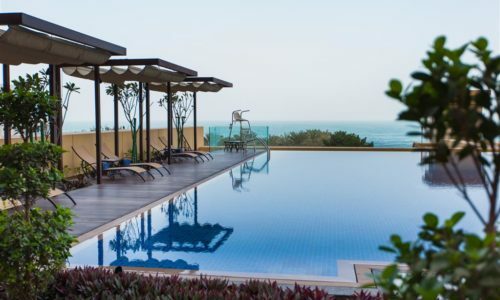 If it is a Dubai beach holiday to JA Palm Tree Court, JA Beach Hotel or a Beach and city combination at JA Ocean View Hotel or JA Oasis Tower, JA Resorts Holidays have the perfect holiday to Dubai for you. Why not a multi-centre with a couple of nights at the mountain retreat of JA Hatta Fort Hotel or an idyllic island stay on a JA Manafaru holiday. For the ultimate Seychelles holiday, the Enchanted Island Resort is a luxury Robinson Crusoe holiday in style. With world class accommodation, perfect locations and a variety of options and activities on offer, JA Resorts and Hotels are perfect for enjoying your holiday in Dubai, holiday in the Maldives or your holiday to the Seychelles. Take advantage of JA Resorts Special Offers and benefits. Check out the FREE kids offers at JA Resorts in Dubai, Maldives and the Seychelles. Premium all-inclusive available in resorts. Why not upgrade your flight to premium economy, Business or even First Class? At JA Resorts Holidays, all our holidays include flights, accommodation, private transfers and representation. We believe that a holiday to JA Resorts starts the moment you book, so we offer a tailor-made experience to suit your needs. We are the experts on JA Resorts & Hotels and our prices are competitive and we bring you the best offers to JA Resorts & Hotels. If you are not sure on what type of holiday or hotel you need, then call or send us an enquiry detailing what type of holiday you are looking for.